2-3 weeks. FREE SHIPPING (Continental USA). ID charms combine a thick, yet lightweight metal alloy charm finished with either 24K gold or pure silver and are handset with Premium AB Swarovski crystals in your choice of beautiful colors. NOTE: Please see important shipping information below. From the leader in pet id jewelry, Park Ave Paws fine id charms combine a thick, yet lightweight metal alloy charm finished with either 24K gold or pure silver and are handset with Premium AB Swarovski crystals in your choice of 40 colors. AB crystals are light reflective and multi-faceted. Also included is up to four lines of custom engraving, using a diamond tipped engraver. This all makes for a very unique and absolutely beautiful id sure grab anyone's attention. Small tags measure approximately 3/4" and have approximately 25 crystals. Large tags measure approximately 1 1/4" and have approximately 50 crystals. Shipping costs are included in the product price. This product will be shipped separately from other items in your order within 1-2 weeks via standard delivery. Sorry, express shipping not available. This item will not count towards any free shipping promotion on other items in your order. Beautifully packaged, exciting to open & so beautiful when I took the Tag out. Waiting for new Crystal decorated Collar to arrive & then Danni will be the star of Bowral (NSW Australia) Dog Society!! Love it!!! 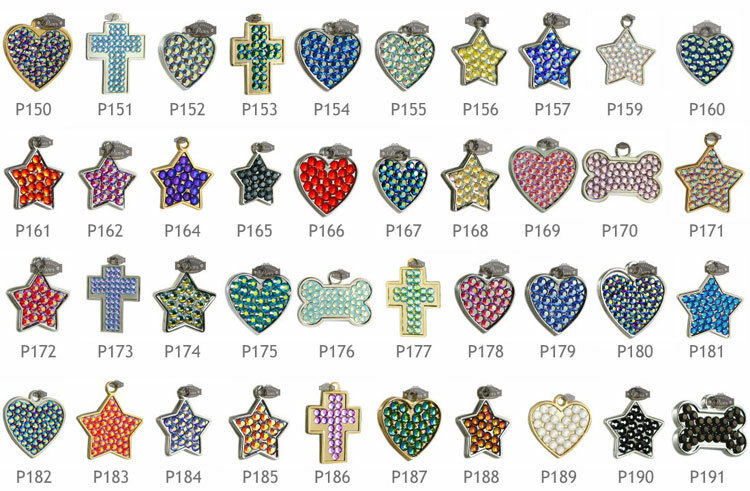 Click the button below to add the Premium Swarovski Crystal Pet ID Tags to your wish list.